HYPNOTIZE WITH THESE EXCITING AIDS! Plug in â€” put this effective machine to work for you. The 10″ Hypnotic Spiral disc revolves at 59 -rpm, causing tremendous eye-fixation and hypnotic motion that seems to bring your subjects into a “deep well of sleep”. Treasured by Professional Hypnotists and serious students alike, it is effective visually and creates prestige that is so very important. Use it for Self-Hypnosis and to hypnotize others â€” in groups or individually. Has an 8′ electric cord, on-off switch, carrying handle and a fine quality 110V AC motor. Complete with disc and simple instructions. Combines 2 trance stimulating effects: Flashing light (framed by a hypnotic disc) and a Metronome beat. Completely adjustable â€” speeds from 40 to 208 beats per minute. Sound and tone from a loud click to a low hollow tap. Completely automatic â€” a precision instrument 4-1/4″ wide x 5-1/2″ high. A fascinating device that folds up and can be carried in your pocket. There is a design printed on the front acetate window and another on the rear “out of focus” disc. By revolving the disc you create a variety of trance stimulating, eye-arresting patterns. Complete with an informative book of instructions and revealing secrets. NEW-POCKET SIZE INVENTION HELPS HYPNOTIZE YOURSELF or OTHERS IN MINUTES! MUST WORK OR MONEY BACK! Hold the hypno-coin in front of the person you want to hypnotize. Gently vibrate the plastic lense. This sets a whirling hypnotic pattern into motion that is so fascinating, it captures and holds your subject’s gaze. Now give your hypnotic suggestions! Get this amazing hypnotic aid complete with a FREE revealing booklet of secrets and instructions that tell you what to say and do, how to command and re-hypnotize with the snap of a finger, how to thrill and amaze them with hypnotic stunts, etc. Get the COIN, Booklet and Stand for Self Hypnosis â€” only $1.00 ppd. Sent in a plain wrapper. Money back if not delighted! Play side one to help you hypnotize others. Record passes hypnotic control to you! Ends like this: “the next voice you hear will take complete control of your hypnotic sleep . . .” then YOU take over! Side Two is for Self-Hypnosis. The hypnotist weaves his compelling suggestions around the unique echo-chamber metronome beat. Gives you a suggestion for re-hypnotizing yourself at will, then awakens you. Study this record, get your own hypnotic technique. Learn how a real hypnotist sounds. Imitate his words, timing and suggestions. Made of unbreakable vinyl, this is a quality 78 rpm Extended Play recording â€” complete with simple instructions and FREE Eye-Fixation spots. #CX-2… $4.95 ppd. Written in Calcutta, India with the cooperation of Sadhu Satish Kumar . 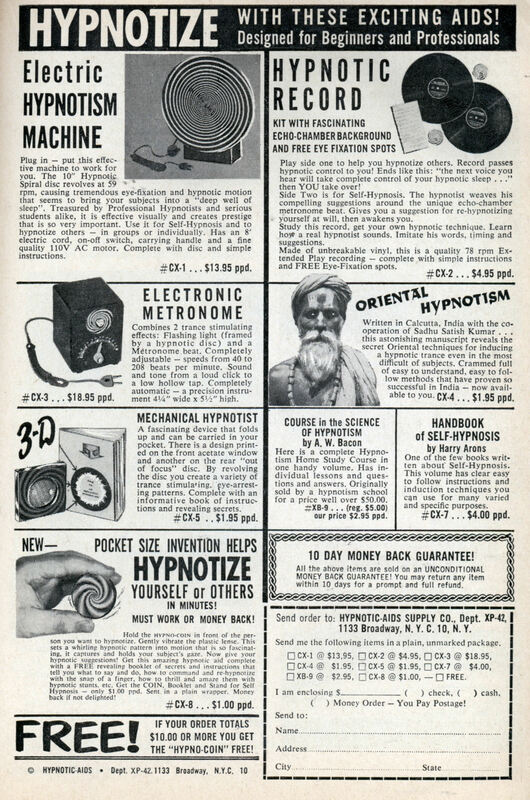 . . this astonishing manuscript reveals the secret Oriental techniques for inducing a hypnotic trance even in the most difficult of subjects. Crammed full of easy to understand, easy to follow methods that have proven so successful in India â€” now available to you. cx-4 … $1.95 ppd. Here is a complete Hypnotism Home Study Course in one handy volume. Has individual lessons and questions and answers. Originally sold by a hypnotism school for a price well over $50.00. #XB-9 … (reg. $5.00) our price $2.95 ppd. One of the few books written about” Self-Hypnosis. This volume has clear easy to follow instructions and induction techniques you can use for many varied and specific purposes. IF YOUR ORDER TOTALS $10.00 OR MORE YOU GET THE “HYPNO-COIN” FREE! All the above items are sold on an UNCONDITIONAL MONEY BACK GUARANTEE! You may return any item within 10 days for a prompt and full refund. 1133 Broadway, N. Y. C. 10, N. Y. Send me the following items in a plain, unmarked package. where do I get the book of oriental hypnotism. jay klaus: Yeah, I’m sure Charlie will get right on that. I”M A PSYCHIATRIST PRACTICING HYPNOTHERAPY. i’M INTERESTED IN THE HYPNOTIC AIDS ESPECIALLY CX 3. SINCE I LIVE IN THE GULF REGION, U.A.E., HOW CAN I ORDE IT? U have not answered my above comment. How can I make PURCHASE IF i LVEE ouside USA. I lve in Abu Dhabi. 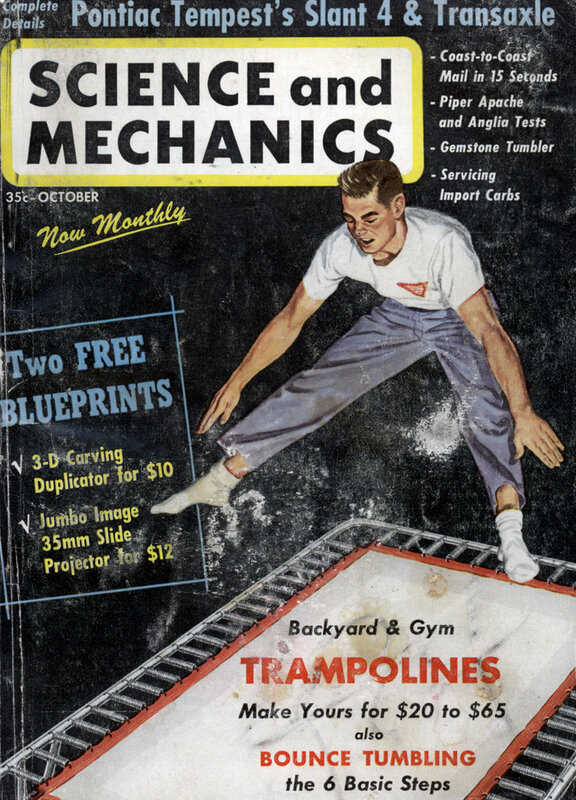 E A Ismail: Obviously you missed the fact, that this is just a scanned page from a magazine from 1960.